Product prices and availability are accurate as of 2019-04-23 09:45:53 EDT and are subject to change. Any price and availability information displayed on http://www.amazon.com/ at the time of purchase will apply to the purchase of this product. 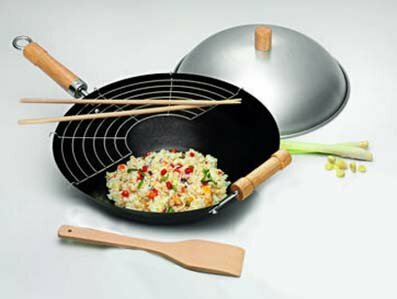 Take the leap into Asian cooking with this handy four-piece wok set from Asian Origins. At its center is a roomy 14-inch wok crafted from professional-weight black carbon steel for even heating and superior temperature retention. The high-sided bowl shape maximizes space to give all food equal surface time, while the Xylan nonstick coating releases food smoothly and makes cleanup a breeze. 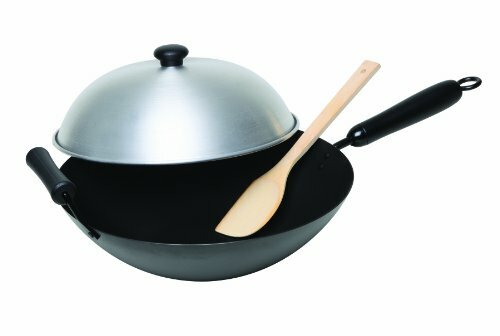 The wok's flat bottom rests securely on any range, including induction styles, and a heat-resistant stick handle and helper loop handle make for cool, comfortable transport. Also included in the set are a chrome-polish dome lid to seal in flavors and nutrients and a natural bamboo spatula for flipping, stirring, scooping, and serving. Need ideas to get started? The care/recipe book provides a nice introduction to the many possibilities of wok cooking. This 4-piece wok set features 14-inch wok, dome wok lid, bamboo spatula, care /recipe booklet. Stir Frying lets you cook meats, fish, vegetables and poultry over high heat, using small amounts of cooking oil. As a result, it is a healthier way to eat and you can prepare a whole meal in no time. Vegetables stay crisp and crunchy and meats, poultry and seafood are tender and juicy. Xylan Nonstick Coating for healthy low fat cooking. Flat bottom for all range types including induction.